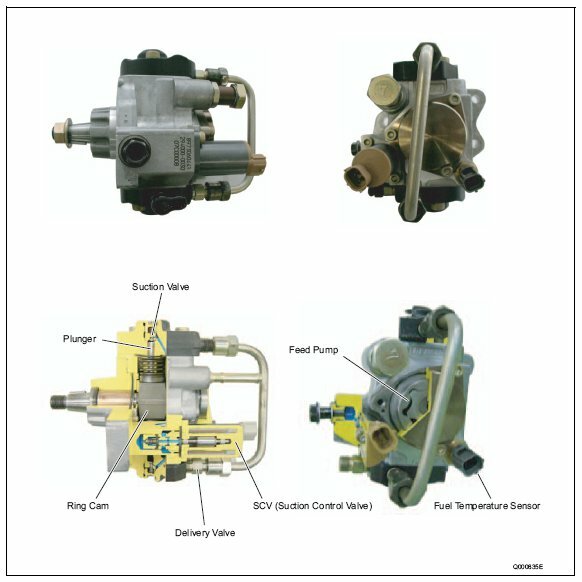 control valve), the fuel temperature sensor and the feed pump (trochoid type), and is actuated at 1/1 or 1/2 the engine rotation. • The two compact pump unit plungers are positioned symmetrically above and below on the outside of the ring cam. • The fuel discharge quantity is controlled by the SCV, the same as for the HP2, in order to reduce the actuating load and suppress the rise in fuel temperature. In addition, there are two types of HP3 SCV: the normally open type (the suction valve opens when not energized) and the normally closed type (the suction valve is closed when not energized). flow damper is to automatically shut off the fuel if a leak occurs in the fuel addition valve passage within the DPNR.